Hello everyone! I really enjoy taking time off especially when I feel saturated with work like in the past weeks. Fortunately, I was invited to an event at the Conrad Manila and got to stay there for 2 days. If you're not yet aware, allow me to inform you that I'm a skincare junkie and I don't mind taking an army of products with me when I'm away from home. Hotels provide basic products like body wash, shampoo and conditioner but they're usually generic which is why I always bring my own for backup. During my first few staycations, I've always brought full-sized bottles but I eventually got the hang of it and now I can estimate what I need to bring. This is when sachets, travel and sample sized products come in very handy. Whenever I pack, I make sure the liquids are securely sealed in a ziplock. I bring one pack of skincare goods and another pack for hair and body care. Notice in the image above that my stash lacks oral hygiene products, this is because I'm okay with using what's in the hotel. I won't be reviewing each item thoroughly knowing it will take forever to do that but I'll try to include short descriptions and reasons why I like taking them with me. Let's get on with it shall we? Before I retire to sleep, I take off my makeup with a cleansing cloth and my current favorite is the Pixi Makeup Melting Cleansing Cloths. I like the relaxing herbal scent and how it effectively removes makeup. I also bring my ultimate favorite micellar water from Bioderma housed in a spray bottle I bought from beabi. After removing my makeup, I double cleanse my face with VMV Hypoallergenics Hydra Balance Gentle Cream Cleanser and exfoliate with the Clinique Turnaround Instant Facial Masque. I also bring cotton rounds and buds with me when I travel so I can stick to my skincare routine. After cleansing and exfoliating my face I head on to applying the VMV Hypoallergenics Superskin 2 Monolaurin + Mandelic Acid Toner for combination skin. I pat on the Shiseido White Lucent Brightening Balancing Softener and top it with L'oreal Youth Code Pre-Essence. About a few months ago, I started having dry and dull skin so I decided to incorporate the use of face masks in my skin care routine. I scouted for different brands and came across the Purederm Snail Age Regenerating Multi-Step Treatment. First of all, I hoarded these masks because they were being sold for 50% off. I've tried a different mask from Purederm in the past and it was quite okay so I figured this variety might be as good, hopefully better. After removing my mask, I use the Clinique All About Eyes Serum in the morning for its depuffing effect and the Shiseido Ibuki Eye Correcting Cream at night. Finally I moisturize my face with the VMV Hypoallergenics Hydra Balance Smart Moisturizer for combination skin and finish up with the Clinique Dramatically Different Moisturizing Lotion +. As for my bath products, I've been using the Snoe Body Ritual Honey Bath Syrup in Nectarine Ginger Tea. I love the fresh citrus scent and the tiny beads that make bathing an invigorating experience. I'm a regular user of Dove Intense Repair Shampoo as well as the conditioner. After towel drying my tresses, I apply a pump or two of the L'oreal Mythic Oil to protect my hair from the heat of blow drying. Another favorite product I enjoy using from Dove is the Original Whitening Deodorant because aside from the fresh scent, I love how it controls sweating without drying your underarms. 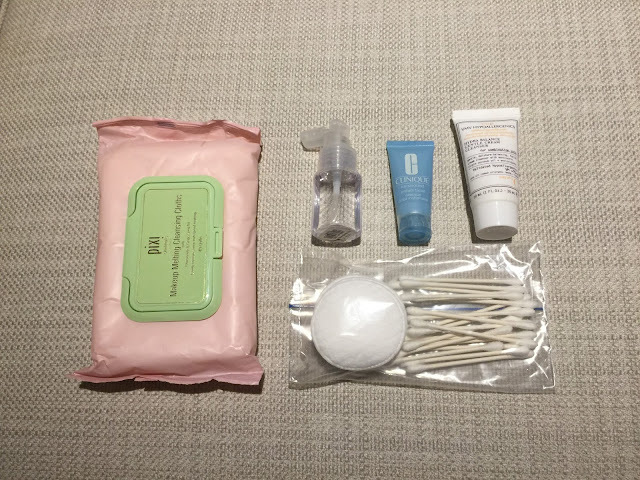 All these products fit in my toiletry bag perfectly. I love that it's easy to find everything I need in one place especially when I'm in a hurry. I also find it really convenient to pack my stuff back in just one bag before heading home. So that's my current travel essentials, do check out other related posts below and have fun browsing through them before you go. Thank you so much for your time and have a great week ahead. Cheers!